The last couple of weeks has brought on the heat along with those pesky horseflies. 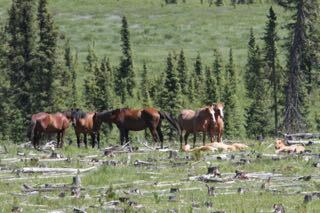 The wild horses are spending their time either out in the open on hilltops where the wind helps keep the bugs at bay or they hang out in the heavy timber using the shade and tree branches to give them some peace from this annual onslaught. 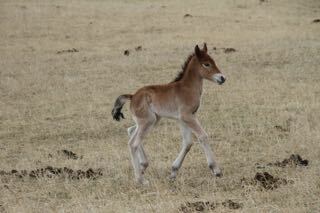 As we travel the back roads we are finding that there are a number of foals on the ground, with some herds having 2-3 per band, but some that had foals earlier have lost them. Predators seems to be the biggest culprits in some areas. 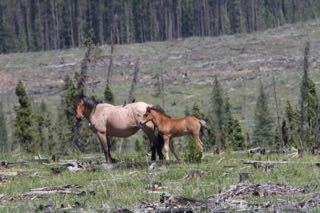 Where the horses are sticking to the bigger clear cuts the survival rate of the foals is higher than those that range in the other areas. In 2001 a small group of concerned individuals decided to stand up for the wild horses after so many atrocities kept occurring to them year after year. With very few seemingly caring about it, WHOAS was incorporated as a non-profit society. Since then we have continued to be a voice for these beautiful animals. Even in 2012 when over 218 horses were culled, WHOAS tried our best to voice our strong objection to this and similar culls. 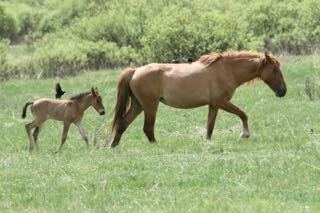 That year we managed to rescue 9 young horses, gentled them and adopted them out to forever homes. We have and will continue to use public education and awareness to make people aware of these wonderful living symbols of our western heritage and history. 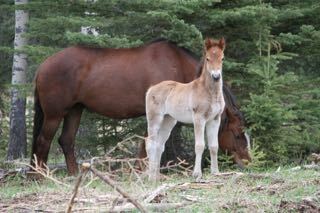 I continue to go into schools and attend meetings of 4H groups, Junior Forest Rangers and other interested environmental and equine groups to spread the word about preserving the wild horses here in our Alberta foothills. As a result of our continuing work along these lines, we have now received our Charitable Status from Revenue Canada. Now with being a registered charity we will be able to expand our work and efforts to maintain our handling facility, our contraception program and offer our education programs. We are now able to issue tax receipts for donations from those who believe in what we are doing for the horses. Because of the delay in receiving our charitable status, we have had to cancel the Wild Horse Jamboree we had planned for the summer as a fundraiser. It is unfortunate that some individuals and/or groups continue to portray WHOAS as the enemy to the welfare of the wild horses, despite our years of fighting for them. 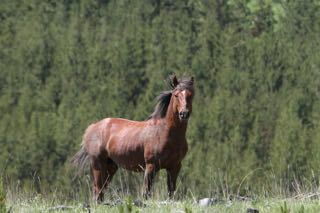 On June 16th the Stakeholder’s Committee held a meeting to discuss strategies for managing the wild horses. WHOAS was able to present what we have done and what we will continue to do moving forward. There are those on the committee and outside of it who still believe that the number of wild horses has to be dramatically decreased and even eradicated from the landscape. It is reassuring that due to the MOU’s that in the areas designated to us that the horses in these areas will be left alone. Since removal of the horses through culling is not off the table at the Stakeholder’s meeting, despite our insistence that it is not a good management tool, it is apparent to those in the scientific community and to WHOAS that our contraception program has to be expanded. Our team is working with a population biologist to determine how many mares would have to be vaccinated just to stabilize the population as it sits at today’s numbers. There is some misinformation about the vaccine used. You can be confident that our team is using the zona-stat-H vaccine produced from the Science and Conservation Centre in Montana. Other PZP vaccines have been produced elsewhere which are not a pure format and are not supported by the scientific community. Again this product is used successfully in zoos throughout the world and in several other jurisdictions throughout North America and Europe to help control wild horse populations. All protocols as outlined for proper use are followed by trained personnel working on our teams. Another concern WHOAS addressed at the Stakeholders’ meeting was the running down and roping of the horses during the cull. We have always indicated that this a very inhumane way and a danger to the horses as well as to the mounts of the license holders. We are working hard to have this method abolished. The other item proposed in the past and again at this recent meeting, was that our wild horses need to be given a distinct designation to offer them better protection. The term “heritage horse” has been used, but this has been met with extremely strong opposition and this would not be accepted. 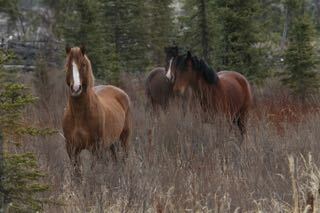 Therefore, WHOAS presented that the horses be given a distinct designation of being called the Alberta Mountain Horse. This would allow the horses to be out of the Stray Animal Act and subsequently, more well-defined regulations could be put into place. There was positive feedback to this idea from several member groups. This probably will not take place until the current horse capture regulations expire in 2017.